Major infrastructure projects seem to be underway everywhere. In Pakistan, a new deepwater port is being linked to a vast road and rail network. In Montenegro, the country’s first border-to-border motorway is being laid. In the remotest part of Kazakhstan, a bustling town is springing up from scratch around a massive new rail terminal. In Laos, a new bridge has broken the world record for the longest span between two piers. And in Rwanda, a new railway is connecting the landlocked country to Tanzania’s port of Dar es Salaam. The common factor in all these projects is that they are parts of an initiative by one nation: China. In a 2013 speech, Chinese President Xi Jinping mentioned the ancient Silk Road. This was the network of trade routes—some established as early as 200 b.c.—that facilitated movement of goods and ideas across Asia, the Middle East, Africa and Europe. Then Xi announced China’s plan to rebuild that ancient network. “This will be a great undertaking,” he said. The Chinese promptly put the plan into action, which is what the projects in Pakistan, Montenegro, Kazakhstan, Laos, Rwanda and more than 60 other nations are all about. Beijing is sparing no expense to better connect the world to China. It calls this project the Belt and Road Initiative, or bri. The initiative consists of a land-based economic “belt” that will include six corridors linking east and west, and a maritime “road” of ports stretching from the South China Sea to Africa’s east coast. It will link 60 percent of the global population, span three continents, and also connect to Latin America as a “natural extension.” At an estimated cost of $5 trillion, it is the most ambitious infrastructure venture in history. The scope is astounding. And it all has one underpinning purpose: to give China dominance over world trade. Many analysts are seeing the alarming implications of this seismic shift toward China. But there is something far more momentous about China’s moves toward dominating global trade that few recognize: It was prophesied in Bible scriptures written thousands of years ago. And now these prophecies are being fulfilled. China itself is an egregious abuser of the human rights of its people and has no concerns about autocrats in other nations tyrannizing their people. So while Western powers sermonize and punish authoritarian governments by withholding aid or even working to remove them from power, China has no compunctions about constructing airports for autocrats, dams for dictators, and terminals for tyrants. Extension of the Southern Expressway in Sri Lanka is one of the major infrastructure projects built by Chinese and Sri Lankan workers under the framework of the Belt and Road Initiative. The Chinese have signed bri contracts with numerous authoritarian governments, military regimes and several of the world’s most corrupt nations, including Uzbekistan and Turkmenistan. China is also pulling in countries that are mired in conflict, such as Yemen, Afghanistan and Iraq. The corruption and conflict make it unlikely that many of these nations will be able to repay China’s loans. In early 2018, the Center for Global Development found that Djibouti, Kyrgyzstan, Laos, the Maldives, Mongolia, Montenegro, Pakistan and Tajikistan are all at high risk of being unable to repay. Several other countries could be added to the list. So why does China continue to hand out massive loans to such nations? Because the bri—and much of China’s related policy—is about more than just economics. Sri Lanka was among the most enthusiastic nations to welcome China’s quick cash. It accepted billions of dollars in loans for such projects as the Magampura Mahinda Rajapaksa Port in Hambantota. This port is at a key location for China’s maritime “road.” But for the Sri Lankan economy, the project was a bust. Instead of fueling growth, the port (and other Chinese-funded infrastructure projects) plunged Sri Lanka into unsustainable debt. By 2016, one third of Sri Lanka’s total government revenue went toward servicing Chinese loans, and the country was forced to apply for debt relief with the International Monetary Fund. From there, the situation only got worse. Pakistan’s Gwadar port is apart of the multi-billion dollar development project with China aimed at constructing a 21st century Silk Road. As pressure intensified and options narrowed, Sri Lanka’s government determined that the only course of action was to hand China a controlling stake in the Rajapaksa Port for 99 years. The transfer set off alarms in Sri Lanka and beyond because it represented a Chinese victory with potential military applications. “The acquisition provided Beijing with a deepwater port in the region in which it can dock its navy, off the coast of its key regional competitor, India,” Foreign Policy wrote on Oct. 29, 2018. Sri Lanka is often cited as the textbook example of China’s “debt-trap diplomacy.” But it is not the only country where Chinese investment is going pear-shaped for the debtor nation and creating conditions for Chinese conquest. Thanks to Chinese cash, the East African nation of Djibouti is already hosting China’s first overseas military base. But the country has borrowed more Chinese money than it can pay back and is now headed toward a debt-to-gdp ratio of 88 percent. Analysts worry that China could use its growing leverage to convince Djibouti to oust the United States military from Camp Lemonnier, America’s only permanent military base in Africa. Such a move would represent a huge loss for the U.S. and a major victory for China. In Pakistan, Chinese-built infrastructure stretches all the way from Gwadar Port on the Arabian Sea up to the Pakistan-China border. For China, this is not just an invaluable crossroads where the “belt” meets the “road.” It is also a safeguard against one of China’s greatest fears: a potential U.S. naval blockade in the South China Sea. Before development of port and road-rail networks through Pakistan, such a blockade would have posed an existential threat to China. But now China has an alternative route established for importing goods—particularly the Middle Eastern oil and gas on which it heavily depends—into China. Pakistan also owes China more than $6 billion for these projects, and is paying exorbitant interest rates on some of the loans. “That kind of debt gives China some leverage,” Chris Chappell of China Uncensored said on Aug. 1, 2018. Thanks largely to that leverage, China has already taken control of Gwadar Port, with a 40-year lease. And now the Chinese are constructing a naval and air force base nearby. A construction site of the Jakarta-Bandung bullet-train development in Bandung, West Java province; China’s push to revive the Silk Road trade routes. The Maldives, located right along the “string of pearls” route, is also heavily indebted to China, thanks mostly to the multimillion-dollar China-Maldives Friendship Bridge. As the Maldives’ economic troubles intensify, many fear that it will soon have no choice but to hand some key assets over to China. In Montenegro, feasibility studies said it was not economically viable to build a highway from the Port of Bar through the nation’s rough terrain to Serbia. In 2014, China dismissed those studies, stepped in and gave Montenegro a loan to build a long stretch of it. Now the motorway is unfinished, and the tiny European nation is in serious financial trouble. If the situation in Montenegro plays out as with Sri Lanka, Beijing could have “a port of entry into Europe from the Adriatic,” Reuters wrote. And the list of nations where China’s control is growing goes on. Six months later, China formally invited Latin American and Caribbean nations to join the initiative. Panama, Antigua and Barbuda, Trinidad and Tobago, and Bolivia have already signed on. More countries are poised to follow. Workers load a shipping crate in the Kazakhstan’s Caspian seaport of Aktau, on August 14, 2018. - Kazakhstan’s Caspian seaport Aktau is a new frontier on China’s much-hyped new silk road. Even before unveiling the bri, the main thrust of China’s approach to Latin America had long been in the same vein: infrastructure financing and development. Starting in 2005, China extended $150 billion in financing to build ports, roads and railways in the region. Several of such projects are being retroactively rebranded as bri successes, prompting criticism that China’s bri is merely pouring old wine into new bottles. But the branding of the projects matters far less than China’s determination to integrate Latin America into its globe-girdling enterprise. China is rebalancing the world economy with the bri and related initiatives. And its progress on this front takes on extraordinary significance when viewed through the lens of Bible prophecy. In our July 2014 issue, Trumpet editor in chief Gerald Flurry wrote about this quickly approaching era. “These ‘times of the Gentiles’ are yet to be fully realized,” but “we are in the outer edges of this catastrophic storm,” he wrote. Colombo Port City is the project between China and Sri Lanka under the China-proposed Belt and Road Initiative, especially the 21st Century Maritime Silk Road. For decades, the U.S. and UK have brought much stability to the world. But in “the times of the Gentiles,” they will lose global power to two main blocs of non-Israelite nations. “While there are many Gentile nations around today, when this prophecy is completely fulfilled there will be two major powers,” Mr. Flurry wrote. One of these will revolve around Germany, and the other around Russia and China. China’s increasing power and connectivity is shifting global power away from the Israelite nations and toward these other nations. Prophecy shows that as this shift continues, China will briefly cooperate in a history-altering way with the German-led Gentile power. Some 2,700 years ago, God inspired the Prophet Isaiah to write about a vast trade bloc that would be formed in our lifetimes. “[S]he is a mart of nations,” the prophet wrote (Isaiah 23:3). The prophecies also mention ancient names for modern Japan, Russia and other nations, showing that they too will be part of this enormous trade bloc. To see China and Europe linked in these Bible prophecies about the end time—and then to see the bri linking them economically today—is astounding. The groundwork is now being laid for this powerful “mart of nations,” prophesied of millennia ago, to come together! Even more astounding is what the Bible shows this “mart of nations” will do in the years ahead. “The Bible contains many prophecies of that European power attacking America—and many other prophecies of America being besieged,” Mr. Flurry writes. He explains that this besiegement will be accomplished by the mart of nations. “All of them are going to besiege America, Britain and the Jewish nation,” he writes. “China and the giants of Asia,” he writes, will form a “brief alliance” with the European bloc. “Should Europe, the resurrected Holy Roman Empire, find a way to take advantage—even for a moment—of key resources and strategic holdings of China, Russia and Japan, it would have more than enough power to besiege the Anglo-Saxon nations …. He draws special attention to Latin America, mentioning prophecies by the late educator Herbert W. Armstrong about this region’s role in end-time events. “Herbert Armstrong long prophesied, and we expect, the alliance between Europe and South America to grow extremely strong,” Mr. Flurry writes. Europe already wields deep influence in parts of Latin America. And once China enters a “brief alliance” with Europe, the influence China is now building will translate into even greater European control over the region. With this level of control in Latin America, the European and Asian powers will be geographically positioned to lay siege to the United States. “With a German-led Europe … possessing great maritime power, North America will be surrounded on the east by Europe and the south by Latin America” (ibid). We are already at the outer edges of “the times of the Gentiles.” And China is now the world’s second most powerful economy, with the bri poised to further expand its might. Deuteronomy 28:52 provides more details about the besiegement of the United States and United Kingdom by the “mart of nations” conglomerate: “And he shall besiege thee in all thy gates, until thy high and fenced walls come down, wherein thou trustedst, throughout all thy land: and he shall besiege thee in all thy gates throughout all thy land, which the Lord thy God hath given thee.” When God was actively blessing the U.S. and the UK, He gave them control over numerous sea “gates,” including the Panama Canal, Sri Lanka, the Maldives and Hong Kong (Genesis 22:17; 24:60). Now, every one of these strategic locations is under China’s control or quickly headed that way. The importance of China’s growing dominance of world trade, and its strengthening links to Europe, is revealed in these Bible prophecies. We are already at the outer edges of “the times of the Gentiles.” And China is now the world’s second most powerful economy, with the bri poised to further expand its might. Control of the world’s sea “gates” is being handed over to the Chinese. This is all setting the scene for the prophesied siege against America. In the near term, these developments point to a grim future for America and some of its allies. The “mart of nations” and the conflict associated with it confirm the prophecies of the Bible. And what else does the Bible prophesy, just beyond this economic siege and the fall of the United States and Britain? The most hope-filled era in human history. “[T]hat trading partnership won’t last long,” Mr. Flurry writes. “Soon they will clash, just before Jesus Christ returns and destroys both of them” (ibid). Christ is going to return to Earth, put an end to mankind’s self-destruction, and usher in an age of peace and prosperity for the peoples of China and all the world! Isaiah had a prophecy for the end time that was twofold. He delivered his message to the temple priests and to the people of Israel. Did you know that most of Isaiah’s temple prophecies are also addressed to God’s own Laodicean Church in the end time? The Laodiceans’ rebellion revolves around God’s government. They don’t want God to rule them. Isaiah has a powerful vision for the Laodiceans, the nations of Israel—and even the whole world. You won’t find a more inspiring, far-reaching vision in all the Bible. It pictures a beautiful and peaceful Earth. The vision reaches out into the universe. 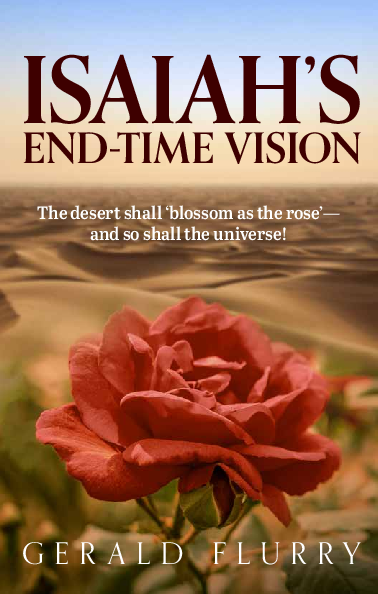 This prophet also reveals how Satan successfully destroys that vision for many of God’s own people. Those who overcome Satan’s deception will be the most honored people ever on this Earth. They will become the Bride of Christ!